[Phil] wrote in to let us know about the DorkbotPDX group orders. The site makes group PCB orders until a cutoff date or the panel is full. You get three copies of your design with no setup fee for just $5/square inch including domestic postage. Not a bad price. We aren’t affiliated with them, but we’re always looking for board production options for hobbyists. BatchPCB is another popular one, and if you need help getting your design ready we’ve got your covered. [Tim] built a MAME cabinet using foam board and some USB peripherals. Inside you’ll find an Acer Aspire One netbook. This build is quick, cheap, and if you get tired of it you won’t feel you’re stuck with it in the way owners of other MAME cabinet builds might. 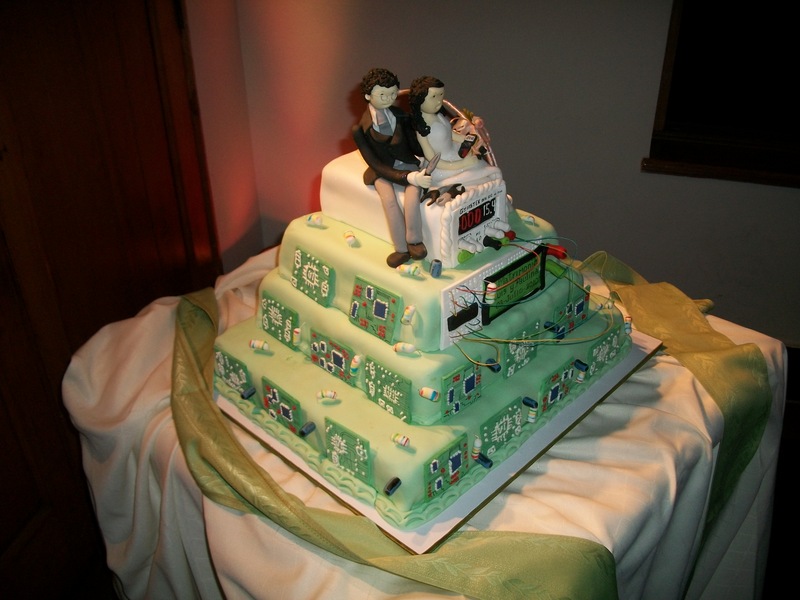 If you are an embedded programmer who happens to be marrying another embedded programmer take note. This wedding cake is perfect for you; decorated with character LCD screens, solderless breadboards, and development boards along with the wires that connect them all together. [Francirius], a read from Chile, says this cake was the handy work of [Paulina Verdejo]. The mini MAME cabinet was on here 10 days ago. So its $5 for 3 square inches as best I can figure. Anyone know of similar services to batchPCB/dorkbot in the UK? What is this Hackaday or Cake Boss? I just emailed my first order off to the Dorkbot group order. I’ll report back some photos, etc once I get the boards. So my small projects will go to them, anything larger than a few inches and I’ll stick with my board house. I’m submitting around 100 square inches to this month’s Dorkbot order, and have used every one of the last 3 or 4. Without the group order the product I’m developing would be in much poorer shape. For a while the group order was going out every 2 weeks, with a 1 week turnaround. Copper costs went up recently, so it’s back down to 1 per month, and the turnaround is up to about 9-10 days, but both of those could change for the better if there’s more usage. I’d love to see a full panel or more go out every week, and enough interest to start a 4-layer order as well. Part of this month’s order is even a small production run of an existing product. I’m getting 99 PCBs for about $350, which is around the same price as 25 boards directly from the fab. I’ve got some pics on my blog, for instance . I was worried about people getting some form of heavy metal poisoning from that cake until I looked at the full size picture. That thing’s awesome! I’ve just spent 2-3 weeks of trial and error (on my part) so that I can get my PCBs from Dorkbot. The service I have got so far is outstanding. I’m not in the USA but from Australia and even so I should get the boards in about 2 weeks and I cant wait ! I wasn’t trying to bash, I was just saying that for a small board run (5-10 boards) of a larger square inch size, it’s cheaper to go with my fab. That said, I will be putting together an order for dorkbot later this week for some smaller boards that I have yet to have fabbed. I love these posts and always get a little bit excited when I see the latest one and start reading. I usually use 4pcb.com or pcb4u.com. I can *usually* get 5-10 larger boards through them for the same price as I could from one of the group orders. Also with some of my boards cost is secondary to speed, so I may spend a little extra on a smaller board for the fast turn around. Unfortunately I don’t know that I’ll make the cutoff, thanks for the heads up. My orders so far have almost all been prototype, so 3 copies is perfect. 4pcb is my default house otherwise, they just can’t generally beat the group order for low volume. OTOH that production order was close between 4pcb and the group order for that quantity, but even then they lost out. My current product however will certainly be run conventionally, as it should be in the 1000’s rather than 10’s of units at a time. Traditionally, a wedding cake’s top tier would be fruit, so how many currants can we expect this to be? The guy behind Dorkbot is currently losing money on his PCB system for small boards (<6 inches). So far he has lost money for the last few runs. If you want the service to continue, order more than 6 inches of PCB! exastify: No wait! The order is _designed_ for small orders. No one should feel like they have to order more board than they need. Under about 1 square inch I technically lose money on an individual order (since the envelope and postage usually run about $2.50), but that’s REALLY not a problem. The average order size is around 6 square inches (usually across multiple boards), and as long as I don’t lose money on the entire order, I’m more than happy to lose money on any individual order. So please! Keep sending in those small boards! That’s why I _started_ this service. Alex, be prepared to pay 2-3 times the price as a US/China fab house. I’ve used Gold Phoenix a few times and I usually have them within about 12-13 days. I looked at having some protos done here, it was around the same cost as a full run from GoldPhoenix. For those of you who may still have designs pending, this order overfilled, so he’s running a second panel in the next couple days. If you get your design in today, you may fit on that second panel. I managed to get mine in and I’m looking forward to seeing the finished product. Boards shipped out today. I have to say I’m quite impressed so far 8 business days is something to be proud of for one guy handling all the orders. I’ll post pictures when they arrive, plus I’m getting in on the next board, already have half my schematic done.